Time is not a renewable resource; respect it. People will always remember the presenter more than the presentation. Always have progression that leads to a call to action. If you think you’ve rehearsed enough, rehearse again. Despite being in different fields, these speakers share many common traits. For example, they all delivered messages about a calling higher than themselves. This builds trust, and that’s the first rule of any presenter: Deliver your presentation based on the benefit to the world, not yourself. Your audience must trust you in order for them to truly listen to you. By beginning with the mentality of ‘what’s in it for them rather than yourself,’ you are more likely to succeed in swaying the audience to believe in you. How do you build trust? While a lot of it has to do with powerful delivery, it also lies in the acronym C.O.U.R.A.G.E. Confident – They truly believe in what they are saying. Optimistic – They give their audience hope. Understanding – They are easy to understand and relatable. Realistic – They are realistic in their vision. Able – They practice what they preach. Genuine – They are genuine and easy to trust. Engaging – They care about what we have to say. Every great presenter possesses these traits. In order to improve oneself, one should keep these in mind when building a bond and rapport with their audience. After all, the way you portray yourself on stage is just as important as what you have to say. 2) Time is not a renewable resource; respect your audience’s time. Audiences can always make more money, but they can never get their time back. Respect your audience’s time by interviewing the event organizer or attendees on what they want to hear most. This will allow you to tailor the presentation to their needs. Avoid tangents and stick to an outline of points that you believe matters most to the audience. Remember: We all have interesting stories to tell, but we need to make sure we choose the ones that move our presentation along. 3) Never deliver a presentation you wouldn’t want to sit through yourself. When giving a presentation, it’s important to put yourself in the audience’s shoes. The phrase, “Do unto others as you would want done to you,” stands true here. If you wouldn’t want to sit through your own presentation, it’s time for a change. Whether it’s because you’re bored or the presentation is outdated, reevaluate. 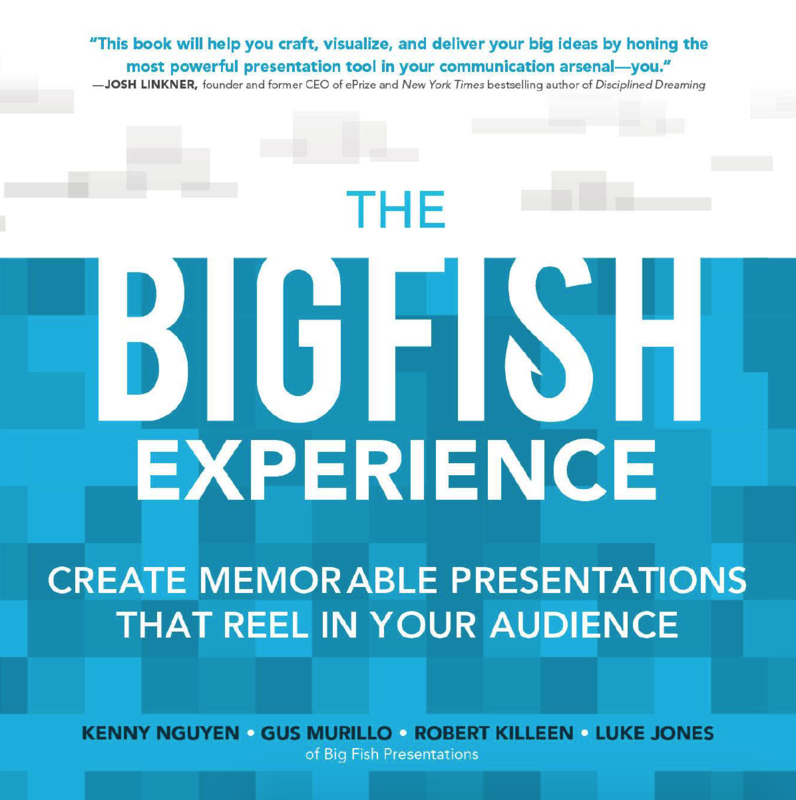 Note: Big Fish Presentations CEO, Kenny Nguyen, mentions that he never likes to give the same presentation more than three times, because content should always be evolving. He edits the existing presentation or creates a completely new one. This keeps things fresh for returning audience members and for the presenter. 4) People will always remember the presenter more than the presentation. This is true that, while you may create the prettiest slide deck ever seen, if you can’t present it, it’s worthless. People came to watch a performance, not you click through and read ever slide. When building an experience, it’s important to not overlook the delivery portion. Slides should be a visual aid, never a crutch; you should always be the focal point of the presentation. The slides need you to tell the story. 5) Be passionate about your topic. If you don’t care about what you have to say, why should the audience? Find a way to discover what makes you passionate in the subjects you speak about. This passion is essential in portraying positive body language. Once you find that passion, research and learn about your subject’s intricacies. Use that information to piece together a simplistic and engaging presentation that will inspire audiences to listen to you. We find stories to be one of the best ways to create meaning and emotion between people. Personal stories break down the wall between audience and presenter by making the speaker more relatable and trustworthy. 7) Always have progression that leads to a call to action. Always have a call to action in your presentation. Otherwise, why are you presenting? If your presentation doesn’t have a point, you’ve not only wasted your time but also the audience’s time. Build up your presentation with main, concise points as an argument that expresses why the audience should believe in your call to action. A good call to action should be concise, simple, and supported with the points delivered prior to making a decision. 8) If you think you’ve rehearsed enough, rehearse again. Be sure to practice in advance. This can be the difference between good presenters and great presenters. A good rule of thumb is if the presentation is for 45 minutes, finish in 35-40 minutes. This will give you cushion room for accidental tangents, as well as more time to engage with the audience later with Q&A. We commonly tell clients that rehearsing to the point where you don’t need a slideshow means you are ready. That way, even if the slide deck crashes, the show goes on. 9) Engage with the audience. Engage the audience, ask questions, get them involved in the presentation itself, and always keep strong eye contact. If you are going to be up there for half an hour, share a little spotlight with someone else. Encourage the participants with your warm personality and you will have won over the crowd. You can even ask your audience, “Have you ever seen a boring presentation? And did you ever think you were going to make it out alive?” Most likely, everyone will raise their hands, and now you have captured their attention by touching on a similar experience. Your foot is in the door; now make sure you don’t lose it. They are on your side now. No matter what the topic is, have fun with your audience. Add humor. Tell a joke at the beginning to break the ice. Do not be a stiff up there on the stage. You will be uncomfortable and so will your audience. In Greek tragedy, an audience should always feel a bond between themselves and the actors. This bond is called catharsis – the emotional response that drives us to reading and watching plays over and over again. Tragedies, too, can be fun experiences. Having fun brings an audience together – they have connected with you. If they associate themselves with you, you have already sold them on the pitch. Whatever the case may be, just remember to have fun up there. While these commandments are elaborated in much more detail throughout our book, we believe just reading these points and applying them on a higher level can get anyone on the right track to becoming a great presenter. Follow them and get ready to create engaging content that can move your audience. Have any questions, comments, or suggestions on what you believe are the perfect ways to pitch? Let us know at hq@localhost. 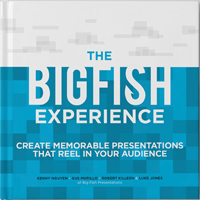 And don’t forget to check out our book The Big Fish Experience for more presentation tips – or you can subscribe to our blog to stay updated on the latest presentation, design, video, and creative trends.